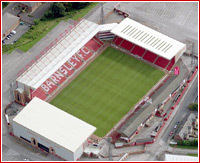 Barnsley have played at Oakwell for well over 100 years and in this time the ground has gone through some significant changes, specifically in the 1990's when three sides of the stadium were rebuilt with only the West Stand remaining of the Oakwell of old and even this has seen partial redevelopment having been converted to all seater in the late 90's following the Taylor Report into the Hillsborough Disaster just down the road at Sheffield Wednesday. The first of the 'new' stands to be built was the East Stand in 1993. 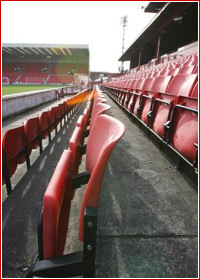 With a capacity of 7,500, and comprising of two tiers, the East Stand is the biggest at Oakwell and contains the majority of the club's executive boxes. Next came the Pontefract Road End in 1995 which sits behind the goals and houses 4,500 home fans as well as the ticket office, club shop and various offices. The third addition came in the form of a 'corner stand' (1998) which sits between the East Stand and Pontefract Road End and is made up of executive boxes and disabled facilities. During the week this stand doubles up as a study centre for local school children. The last major redevelopment of the stadium came in 1999 when the away end finally had a proper stand built on it. Called simply 'The North Stand', it can hold up to 6,000 away fans or be split for home and away fans as it contains two completely separate sets of turnstiles. It also contains the team's changing rooms and academy facilities for the state-of-the-art training ground that is behind the stadium. Built alongside The North Stand was a new police control room which sits above the tunnel in the corner of the stadium and has an electronic scoreboard atop it.